Real Good Dogs Deserve Real Food Treats! 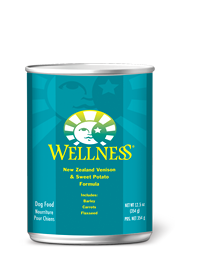 Show your dog extra love with a natural dog treat that is as healthy and wholesome as it is delicious. 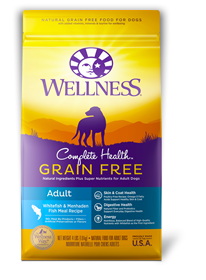 We know you want to show your dog extra love with a treat that is as healthy and wholesome as it is delicious. 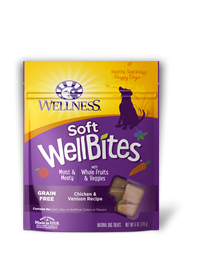 Our special little WellBites combine a unique blend of healthy ingredients like lamb, salmon, sweet potatoes, apples, blueberries and flaxseed into a soft, tasty and nutritious treat. These real food bites are a great size for training, treating, or just plain spoiling! Chicken, Venison, Chickpeas, Ground Potatoes, Vegetable Glycerin, Guar Gum,Carrots, Cane Molasses, Salt, Natural Smoke Flavor, Blueberries, Garlic Powder,Flaxseed, Phosphoric Acid, Sweet Potatoes, Apples, Sorbic Acid (a preservative),Mixed Tocopherols added to preserve freshness, Rosemary Extract, Green Tea Extract,Spearmint Extract. Calorie Content (Calculated): This product contains 3,311 kcal/kg or 8 kcal/treat ME(metabolizable energy) on an as fed basis.